So What Exactly Is A “Heart Dog” Anyway? 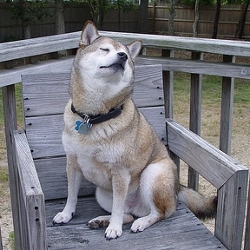 Wolf is a sesame colored, male, Shiba Inu. He was born on August 18, 2000, and he came to live with my blog-friend Janet in the fall of 2001. I asked Janet to talk to me about how Wolf came into her life, Wolf’s personality, and why he stands out as her "heart dog." Originally, Wolf belonged to a co-worker who got him from a pet store (yeah, I know). After 9/11, the co-worker joined the army and I offered to keep Wolf for him while he was gone. When he returned, he decided to let me keep Wolf, which made me very happy. Wolf is a true Leo, which combined with a Shiba’s view of “everything is mine” makes for some fun times 🙂 He can be very demanding, but as long as the discipline is there, it works out. He has the funniest way of looking at me out of the corner of his eye when he wants to play or wants a treat. He jumps up on the bed every morning for a few minutes of snugglies and face licks, then he wants his breakfast and his morning walk. He’s great with kids that are normally afraid of dogs. There’s just something about Wolf…I don’t know if I can define it. My friends joke and say I only have one dog (I have two, Max is my other dog) because I talk about Wolf so much. I love Max, too, but…there’s something about Wolf! He makes me smile with his antics, he is a bit standoffish (like me), and he’s gorgeous. He gives me unconditional love (well, as long as I feed him *smile*) and he gives me a reason to get out and walk every day, even when I was going through cancer treatment and didn’t really feel like it. He makes me proud sometimes, too; one day we were at a craft fair, sitting on a stone wall, just watching the crowd go by. A little boy came over, stared at Wolf and asked if he could pet him. I said sure, and he did, very tentatively. Wolf accepted the attention (as is his due) and the boy sat there very quietly with his hand on Wolf. His parents turned around, saw this and came over. They quietly told me that this boy had been attacked by a dog and was very afraid of them, that this was the first time he’d touched one or gone near one since the attack. 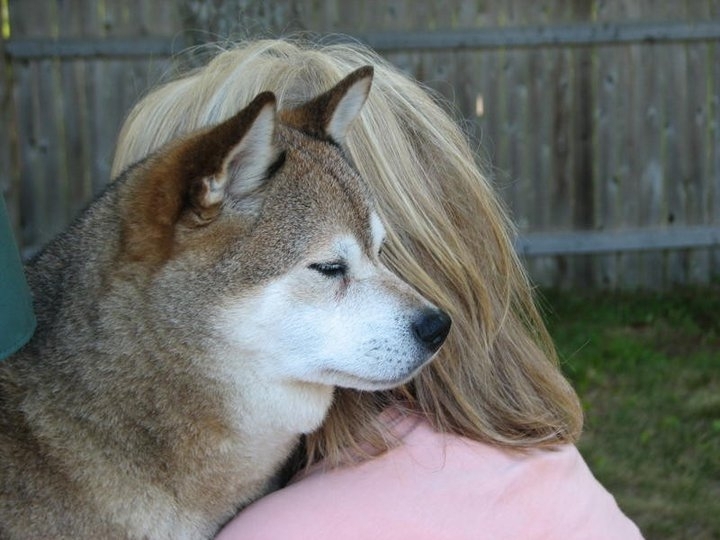 Shibas, as we all know who own them, are not a dog for everyone. But he’s perfect for me. He is a very different dog. He loves me, and will come and sit next to me and press into me. He’ll allow me to put my arm around him, and we have a good time together!